Workers quickly moved the barriers blocking the newly painted traffic lanes over the new $40 million bridge Tuesday, and the switch was made. With no fanfare and just a handful of observers to mark the occasion, the new Lagoon Pond drawbridge that spans the channel between Vineyard Haven and Oak Bluffs opened to traffic about 2 pm Tuesday afternoon. The switch from the temporary to the permanent bridge was straightforward. Crews from general contractor Middlesex Corp. briefly stopped traffic and moved traffic cones and barrels from one side of the road to the other. Within minutes, a steady stream of traffic flowed in both directions. Motorists, many of whom have watched the bridge take shape, celebrated the occasion with beeping horns and shouts of congratulations. One man leaned out his car window to take pictures. 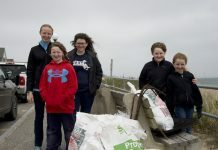 Members of the Lagoon Pond bridge committee (LPBC) were the first to drive from Oak Bluffs to Vineyard Haven. LPBC chairman and Tisbury selectman Melinda Loberg, smiling and waving from behind the wheel of her bright red Jeep, took former Martha’s Vineyard Commission Executive Director Mark London and committee member Scott Tuttle for a commemorative ride, followed by Tisbury selectman Tristan Israel in his silver pickup truck, with his passenger Oak Bluffs selectman Gail Barmakian. 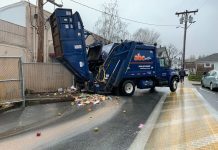 Earlier crews worked feverishly to clean the lanes of debris and attend to last-minute details as a small group of officials gathered to mark the moment. Mr. London, who helped oversee the design process, said the bridge represented a good example of groups working together. As an example, he pointed to the landscaping plan that would include a park and pedestrian walkway along the shore and under the bridge. “It is nice to see one of the Island’s biggest projects come to fruition,” Ms. Barmakian said. The remaining phase of the project to replace the aging and sporadically unreliable 1930s-era drawbridge is the removal of the temporary bridge, put in place while construction proceeded on the permanent bridge. That process is expected to begin soon, Ms. Loberg told The Times. The contractor, Middlesex Corp., has a compressed timeline to complete the work in the water by Jan. 31, 2016. State Division of Marine Fisheries (DMF) regulations restrict work that would impede or disturb the flow of water in the construction area from January 15 through May 31 to protect the spawning and juvenile development of winter flounder and shellfish. The project is on schedule, however, and weather permitting, Middlesex expects to have the bridge dismantled by the deadline, Ms. Loberg said. She said more traffic delays can be expected. “There’s parts of the bridge and adjacent sidewalk, et cetera, that have not yet been constructed because of the presence of the existing temporary bridge,” she said. 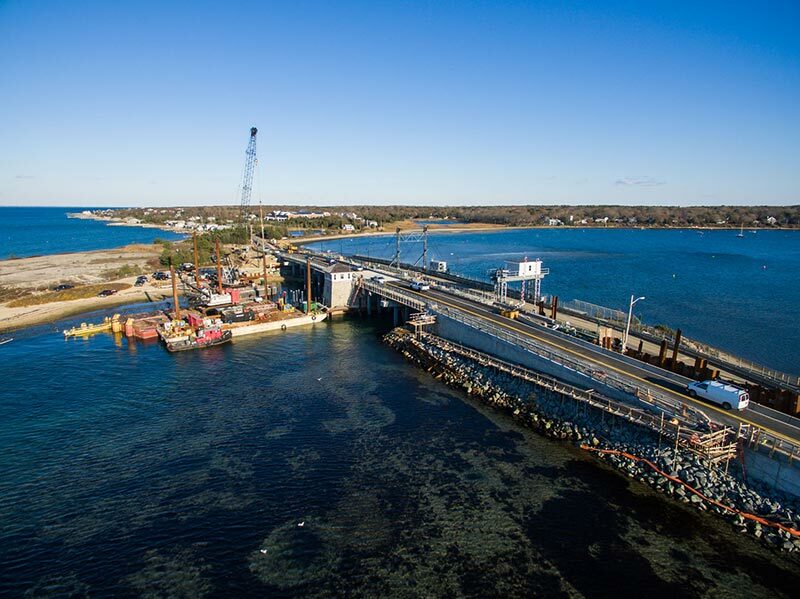 The bridge project, including landscaping on both the Tisbury and Oak Bluffs sides, is expected to be complete by June 2016. The initial construction estimate for the permanent drawbridge was $37.9 million, but the value of the contract MassDOT awarded was $43.7 million. Construction began in November 2013. MassDOT announced plans in 2003 to replace the failing Lagoon Pond drawbridge in two phases, starting with the temporary bridge that opened in January 2010, built at a cost of $9.3 million. The original construction schedule called for the permanent bridge to open in 2014, but the project was delayed by a lengthy review process. MassDOT gave two basic reasons for its two-phase plan. Building a temporary bridge allowed vehicular traffic (which can be as much as 14,000 vehicles per day in the summer, according to Martha’s Vineyard Commission figures) to be rerouted during the construction of the permanent bridge, and also allowed the drawbridge to continue to accommodate boat traffic, especially for emergency refuge in Lagoon Pond for boats in the harbor. Engineers believed there was considerable risk that even with repairs, the previous bridge, which opened in 1935, would fail before a permanent new bridge could be built. In 1935 the bridge builders predicted with uncanny accuracy that their bridge would last 75 years. It lasted 78 years. MassDOT bridge project manager Steve McLaughlin told a bridge committee meeting in June 2014 that he expected the new bridge to last 75 years. The LPBC was created in 2005 to provide a conduit for local comments to MassDOT. Oak Bluffs and Tisbury selectmen appointed the committee members. 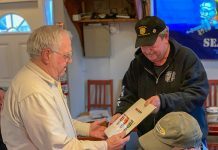 Former Martha’s Vineyard Commission Executive Director Mark London and senior planner Bill Veno also participate as nonvoting members on the committee, and the commission’s staff provides assistance and organizes the meetings. Ms. Loberg said she can’t believe it’s been 10 years since talk of a new bridge first started.